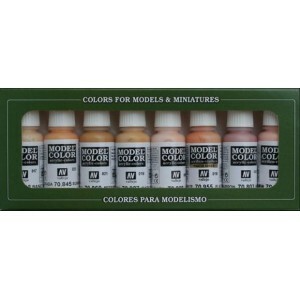 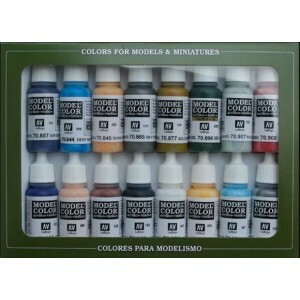 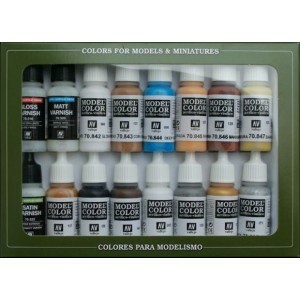 Folkstone Basics Description Collection of 16 color sets of Model Color for painting models and miniatures. 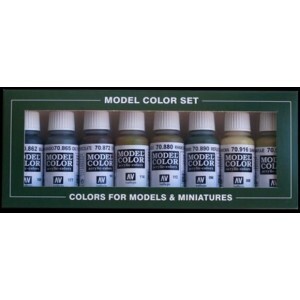 Each one of these sets has a selection of special colors for painting vehicles, figure..
Folkstone Specialist Description Collection of 16 color sets of Model Color for painting models and miniatures. 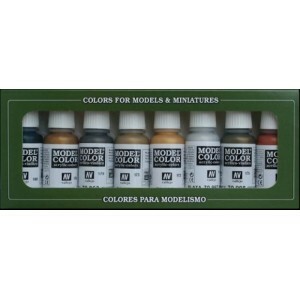 Each one of these sets has a selection of special colors for painting vehicles, fi..
Wargames Basics Description Collection of 8 color sets of Model Color for painting models and miniatures. Each one of these sets has a selection of special colors for painting vehicles, figures,..
Orcs and Goblins Description Collection of 8 color sets of Model Color for painting models and miniatures. 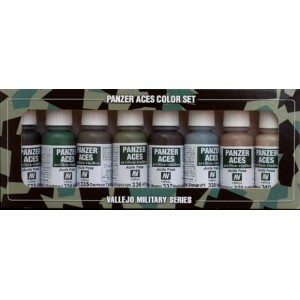 Each one of these sets has a selection of special colors for painting vehicles, figures.. 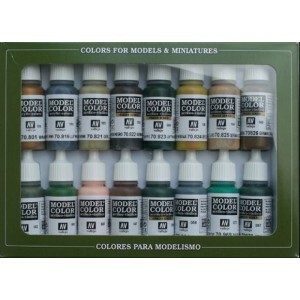 Non Death Chaos Description Collection of 8 color sets of Model Color for painting models and miniatures. 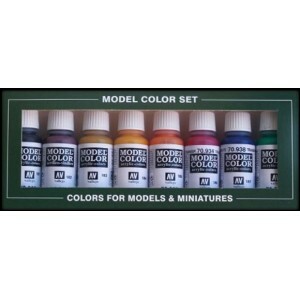 Each one of these sets has a selection of special colors for painting vehicles, figures,..
WWII German Description Collection of 16 color sets of Model Color for painting models and miniatures. 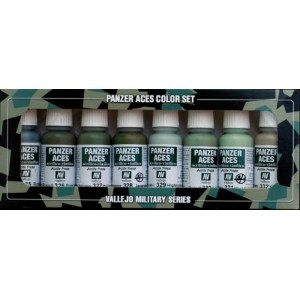 Each one of these sets has a selection of special colors for painting vehicles, figures, et..
Panzer Colors Description Collection of 8 color sets of Model Color for painting models and miniatures. 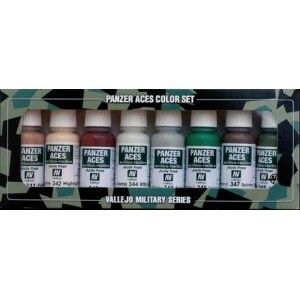 Each one of these sets has a selection of special colors for painting vehicles, figures, e..
WWII Allied Description Collection of 16 color sets of Model Color for painting models and miniatures. 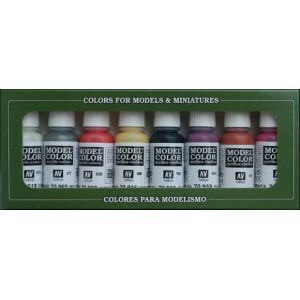 Each one of these sets has a selection of special colors for painting vehicles, figures, et..
Napoleonic Colors Description Collection of 16 color sets of Model Color for painting models and miniatures. 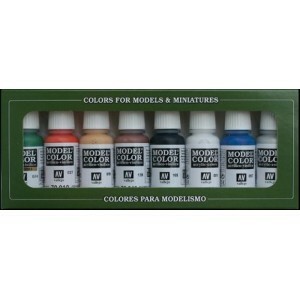 Each one of these sets has a selection of special colors for painting vehicles, figur..
American Civil War Description Collection of 16 color sets of Model Color for painting models and miniatures. 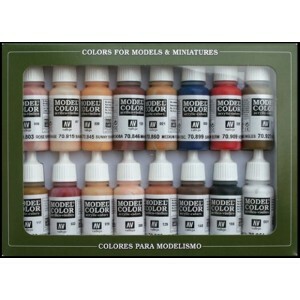 Each one of these sets has a selection of special colors for painting vehicles, figu..
Wargame Special Description Collection of 16 color sets of Model Color for painting models and miniatures. Each one of these sets has a selection of special colors for painting vehicles, figures..
WWII German Camouflage Description Collection of 16 color sets of Model Color for painting models and miniatures. 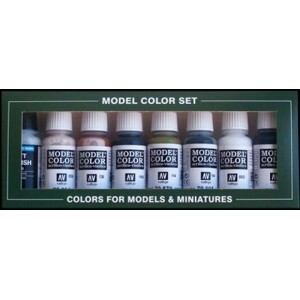 Each one of these sets has a selection of special colors for painting vehicles, ..
Metallic Colors Description Collection of 8 color sets of Model Color for painting models and miniatures. Each one of these sets has a selection of special colors for painting vehicles, figures,..
VALLEJO 70119 - Face Painting Set..
Panzer Aces NR 1 (Rust, tracks, rubber,...) Description Each set contains a selection of special colors, like those used to wear tanks, tires, tarps, lights, ribbons, periscopes, and uniforms fo..
Panzer Aces NR 2 (Wood, leather, stencial...) Description Each set contains a selection of special colors, like those used to wear tanks, tires, tarps, lights, ribbons, periscopes, and uniforms ..
Skintones Colors Description Collection of 8 color sets of Model Color for painting models and miniatures. 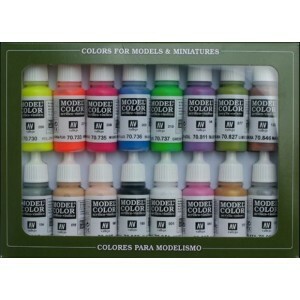 Each one of these sets has a selection of special colors for painting vehicles, figures..
Skintones Colors Description Collection of 16 color sets of Model Color for painting models and miniatures. Each one of these sets has a selection of special colors for painting vehicles, figure..
Panzer Aces NR 3 (Crew Uniforms) Description Each set contains a selection of special colors, like those used to wear tanks, tires, tarps, lights, ribbons, periscopes, and uniforms for the crew..
Panzer Aces NR4 (Crew Uniforms) Description Each set contains a selection of special colors, like those used to wear tanks, tires, tarps, lights, ribbons, periscopes, and uniforms for the crew,..
Panzer Aces NR 5 (Crew Uniforms) Description Each set contains a selection of special colors, like those used to wear tanks, tires, tarps, lights, ribbons, periscopes, and uniforms for the crew..
Panzer Aces NR 6 (Skintones, camouflage...) Description Each set contains a selection of special colors, like those used to wear tanks, tires, tarps, lights, ribbons, periscopes, and uniforms fo..
Transparent Colors Description Collection of 8 color sets of Model Color for painting models and miniatures. 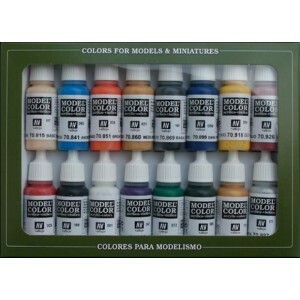 Each one of these sets has a selection of special colors for painting vehicles, figur..
Demag Rusia 1942 Description Collection of 8 color sets of Model Color for painting models and miniatures. 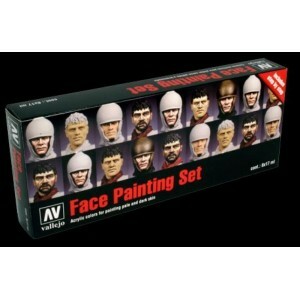 Each one of these sets has a selection of special colors for painting vehicles, figures..